The record is made up of 1 volume in 2 parts (391 folios). It was created in 15 Oct 1937-11 Aug 1939. It was written in English. The original is part of the British Library: India Office The department of the British Government to which the Government of India reported between 1858 and 1947. The successor to the Court of Directors. Records and Private Papers. This volume primarily concerns British policy regarding the eastern and south-eastern boundaries of Saudi Arabia, specifically those bordering Qatar, Abu Dhabi and Muscat (i.e. the Sultanate of Muscat and Oman). Much of the correspondence relates to British concerns that oil companies operating in the region may begin prospecting in disputed territory. References are made to various existing and proposed lines, including the 'blue line' (laid down in the non-ratified Anglo-Ottoman Convention of 1913 and redefined and adopted in the Anglo-Ottoman convention of the following year). Reference is also made to a 'final offer' proposed by the British to the Saudi Government in November 1935, since which time no conclusion has been reached. The reported activity of the California Arabian Standard Oil Company (Casoc) near Qasr-es-Salwa [Salwá, Saudi Arabia] (located east of the blue line), and whether this activity necessitates a renewed effort by the British to reach a settlement with Ibn Saud [‘Abd al-‘Azīz bin ‘Abd al-Raḥmān bin Fayṣal Āl Sa‘ūd] regarding the Qatar-Saudi boundary. Ibn Saud's claim to Jebel Nakhsh [Khashm an Nakhsh, Qatar], which lies in territory included in the Qatar oil concession. Whether the Shaikh of Abu Dhabi should be persuaded to cede Khor-el-Odeid [Khawr al ‘Udayd] to Ibn Saud. The impact of Britain's Palestine policy on Anglo-Saudi relations. The Foreign Office's suggestion that the Khor-el-Odeid question should be submitted to arbitration. 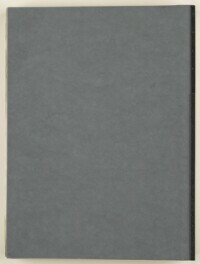 In addition to correspondence dating from 1937-39, the volume contains copies of correspondence dating from April 1904 (including translations of two letters from the Shaikh of Abu Dhabi), which discusses Abu Dhabi's claim to Khor-el-Odeid. Correspondents include the following: the Political Resident A senior ranking political representative (equivalent to a Consul General) from the diplomatic corps of the Government of India or one of its subordinate provincial governments, in charge of a Political Residency. in the Persian Gulf Historically used by the British to refer to the sea area between the Arabian Peninsula and Iran. Often referred to as The Gulf or the Arabian Gulf. (Lieutenant-Colonel Trenchard Craven William Fowle); the Political Agent A mid-ranking political representative (equivalent to a Consul) from the diplomatic corps of the Government of India or one of its subordinate provincial governments, in charge of a Political Agency. 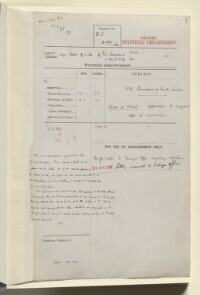 , Bahrain (Captain Tom Hickinbotham); His Majesty's Minister at Jedda (Sir Reader William Bullard); the Secretary of State for Foreign Affairs (Edward Frederick Lindley Wood, Viscount Halifax); the Secretary of State for India and Burma (Lawrence John Lumley Dundas, 2nd Marquess of Zetland); the Viceroy of India (Victor Alexander John Hope, Lord Linlithgow); the Minister for Saudi Foreign Affairs [Fayṣal bin ‘Abd al-‘Azīz Āl Sa‘ūd]; officials of the Foreign Office, the India Office The department of the British Government to which the Government of India reported between 1858 and 1947. The successor to the Court of Directors. , and the Government of India's External Affairs Department. 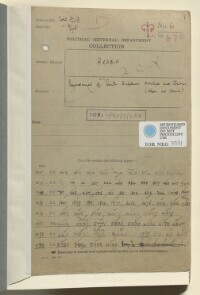 Also included are the following: copies of the minutes of meetings of the Committee of Imperial Defence's Standing Official Sub-Committee for Questions Concerning the Middle East, dated 8 November 1937 and 8 February 1938; a sketch map depicting the various possible boundary lines of south-eastern Saudi Arabia. 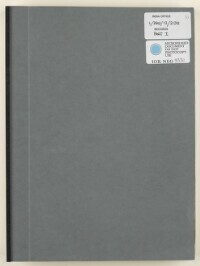 The volume includes a divider which gives a list of correspondence references contained in the volume by year. 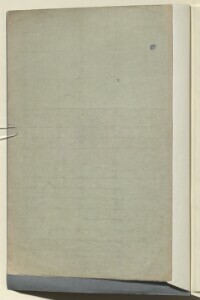 This is placed at the back of the correspondence (folio 2). 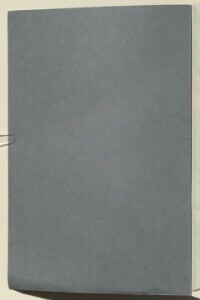 Foliation: this file consists of two physical volumes. The foliation sequence commences at the front cover of volume one (ff 1-188) and terminates at the inside back cover of volume two (ff 189-395); these numbers are written in pencil, are circled, and are located in the top right corner of the recto The front of a sheet of paper or leaf, often abbreviated to 'r'. side of each folio. An additional foliation sequence is present in parallel between ff 2-394; these numbers are printed, and are not circled. A previous foliation sequence, which is also circled, has been superseded and therefore crossed out.